Doctor Who: Revisiting THE TIME WARRIOR | Warped Factor - Words in the Key of Geek. Dr. Moo celebrates the debut of the Sontarans. I went into The Time Warrior for the first time not knowing much about it; in fact the title generated images in my mind of the War Doctor, before it did a Sontaran! More than that it’s got the word “time” in the title, and for Doctor Who you know this can mean one of either two things: it’s either really good (The Time of Angels, Time Crash, The Time Meddler) or really bad (Time-Flight, Timelash, Time & the Rani) but nowhere in between. So which is this? There’s only one way to find out! Hands up who wanted to see the Doctor’s legs in the opening titles? The story’s not even started and it’s already really really stupid! But fear not because the next thing you see is that the writer credit goes to Robert Holmes – fear not fans, this’ll be good! Since the end to season 10 with the fantastic The Green Death there’s been some changes. For one thing there’s no more of Roger Delgado’s until-recently-definitive Master (Michelle Gomez has overtaken him; yes I said it!) due to his unfortunate untimely death. There’s also no more Jo Grant following Katy Manning’s decision to leave the show in the previous story. Even UNIT and the Brig barely get a look in beyond a glorified cameo to set the Doctor in motion. 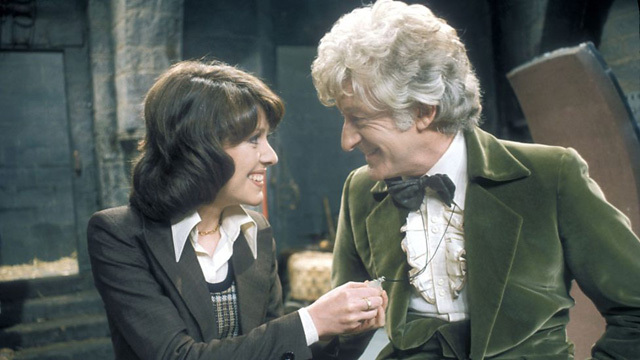 Instead say hello to another first, the one and only Sarah Jane Smith. Sarah is one of those companions you only really associate with their second Doctor, similar to what would later happen with Adric, Nyssa, Tegan, Peri, Rose and Clara, so it’s easy to forget how well Sarah suits Doctor the Third. She’s the perfect antidote to Pertwee’s extremely arrogant Doctor, every bit as much as she later would be for Baker’s, and to a lesser extent Tennant’s. Where Jo would simply do what the Doctor says Sarah asks why and isn’t afraid to talk back to him. Sarah has since gone down in history as one of the best companions, if not THE best, that the Doctor ever had, even starring in two spin-offs, and it all started here. Want another first? How about the first time Gallifrey is named? So I guess we have Holmes to thank for that too. But the reason we’re looking at this serial today is for another thing entirely. New titles, new companion, how about a new monster? 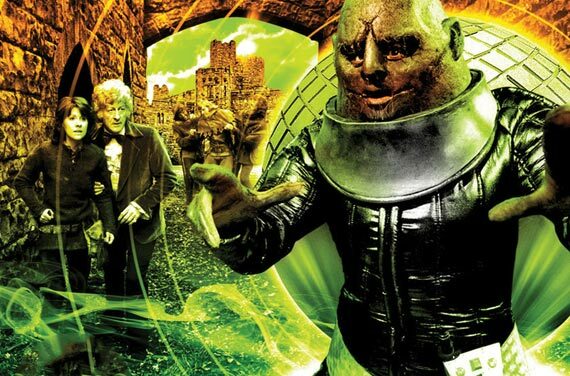 Fan-favourite monsters, the Sontarans! 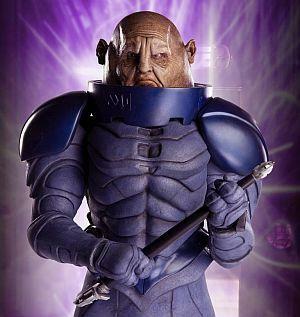 Well actually just one on this occasion: Commander Linx of the Fifth Sontaran Army Space Fleet. The story told in the four episodes that make up The Time Warrior is a basic enough affair, but that’s okay with me – with much of the Pertwee era filled to bursting with intrigue and political agendas a simpler approach is a welcome change. The basic overview is that Linx has had to repair his ship so he lands on the nearest planet, Earth, where it’s currently the middle ages and so the supplies he needs are not present. His response is to go to the future, specifically the 1970s or 80s, and kidnap scientists from UNIT to hypnotise them so that they help him – it’s here that the Doctor gets involved. With the Doctor comes investigative journalist Sarah, having stowed away in his TARDIS. The Doctor’s task is to rescue the scientists (and Sarah) and get them back to the future. But this is a Robert Holmes script so naturally he throws in a host of entertaining supporting characters. Most notable is Irongron, whose castle is where Linx has taken refuge. Then we learn that the castle is not actually his but one he’s stolen from one Lord Edward of Wessex. Irongron is being given futuristic weaponry by Linx, which he uses to launch attacks on Lord Edward so that the Doctor is drawn into the conflict. At one point Irongron captures Sarah and she naturally believes the Doctor is working with him. Then Linx gives to Irongron a robotic knight, which he uses to attack Edward’s archer Hal following his capture, allowing for the obligatory Jon Pertwee High Adreniline Really Really Dated But Still Pretty Awesome Action Sequence that every Third Doctor story seems to have in some form. It’s not on par with the high speed chases seen in The Daemons, his sword fight from The Sea Devils or those occasions when he got to use the so-called Whomobile but who cares? He’s fighting a robot knight! 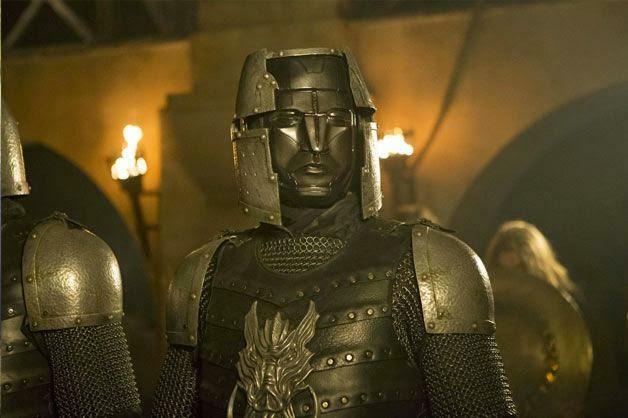 I can’t be the only one who was reminded of this when Robot of Sherwood aired, right? 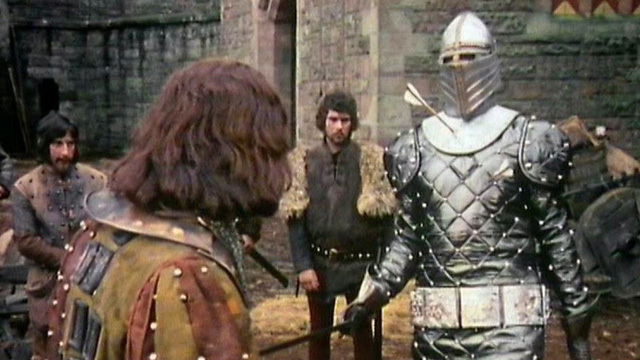 After that action sequence is over, the story slows down a little as the Doctor and Lord Edward draw up their plans and Irongron and Linx prepare theirs. There’s a lot of back and forth between castles that doesn’t do much for me and almost left me wanting to hit fast-forward if not for the brilliance of Holmes’s script. I guess this is one of those times when watching the serial in its episodic format is preferable to marathoning it. 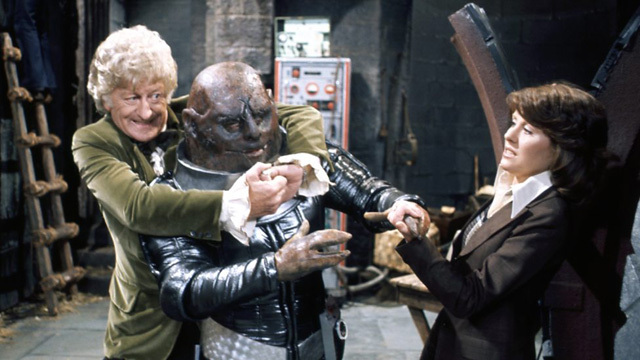 The story must come to an end eventually though when the Doctor and Sarah return to Wessex Castle and rescue the trapped scientists using the obligatory Scientific Liberty that is an Osmic Projector, before meeting Linx one last time as Pertwee gets to show off his hand-to-hand combat besting him. But he’s not defeated yet. Linx staggers into his spaceship and prepares to initiate the launch sequence, knowing full well that this will destroy the castle and everyone in it. It looks like there’s nothing that can be done to stop him when the skilled archer Hal steps forward and shoots Linx right in the probic vent killing him instantly. But for a villain as nasty as Linx a mere death won’t do – and Holmes fully appreciates this. Instead of just letting Linx die he has him fall on to the controls so that the launch never takes place but the fuel still ignites. Everyone flees the castle just as the entire building explodes and the audience at home cheer at the ultimate defeat of Linx and Irongron. It’s a rather explosive (I’m not even sorry) way to end the story, but after everything that goes before it’s the only way that it can end. I guess you can retcon something about improved cloning technology over time, but as they’re a time-traveling species I don’t buy it. But if I wanted to moan about redesigned monsters I would 1) write a different article to this one, 2) complain about the 2010 Daleks instead and 3) be wasting my time because no-one cares. So I won’t do that. Let’s not be negative when we don’t need to be. So what should we make of The Time Warrior today? For starters it’s worth watching simply to be treated to a Holmes script. No it’s not as good as some of his others like Pyramids of Mars, The Talons of Weng-Chiang or The Caves of Androzani, but it’s still Robert Holmes on fine form and when you’ve got that you can’t go wrong – even on a bad day he could write better Doctor Who on his own than many of the show’s other writers combined. Does The Time Warrior achieve the levels of perfection that we should usually expect from such a writer? No. But it’s still brilliant. 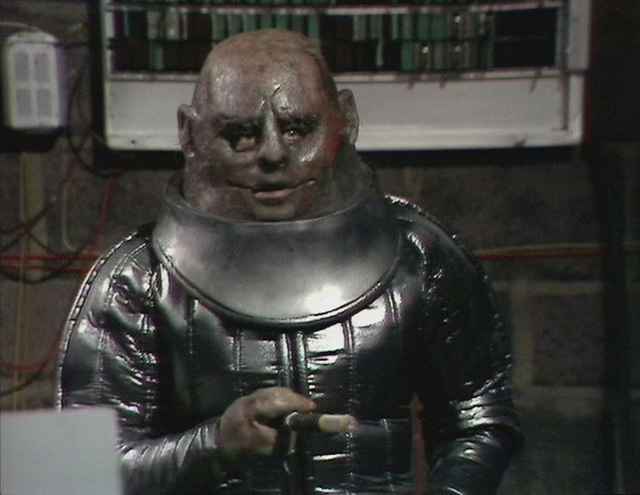 Pull the DVD off the shelf to watch The Time Warrior again today and be reminded of a simpler time before Sontarans were used for comic relief and could actually be credible villains. You’ve forgotten how good a monster the species really is. I think you’ll be pleasantly surprised.